Sometimes little oddities like this make me curious! The question is when your indexes are in backup mode (ie read-only) and you issue a request to rebuild an index, what happens? Then sometime later when the index comes out of backup mode the rebuild will start. It won’t start straight away. The index server needs to be ‘activated’, perhaps by the end-user trying to do a search, or I believe the index server checks hourly for tasks to perform. When the rebuild is completed, the event log will get the normal message added to it saying that the rebuild was complete. Will update the post in a second, or three. So following on from that. 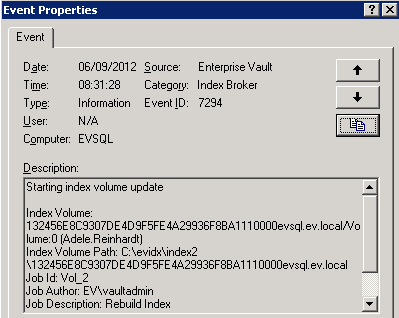 If the index rebuild is running, and then the indexes are put into backup mode what happens? Is the index rebuild process terminated? I honestly didn’t try that. I will give it a go, and report back the results. What I did was my ‘normal’ test here. I rebuilt the index as normal, and it took just about 20 minutes to rebuild (there are 12,000 items in the index). I left them like that for 20 minutes, then took them out of backup mode, and waited. I also did a search, and could see only results from the first 2000 items.